My dog Kizzie died at home during the night of 30/10/09. I found her this morning under the dining room table. I'm gutted, to say the least. I had 3 dobermanns. One died before Kizzie and I'm left with Levi. Kizzie was very special. Locally, everybody who met her thought she was one of the most gentle dogs ever! She was very playful, a good mum type to Levi, and was very bossy. She wanted to be noticed, and amused us with no end, but first and foremost she was there for us when we needed to talk. She listened, kissed and rested her head on our shoulder like she understood. She had always been full of energy, until we received her back from the kennels after our honeymoon. She got ill fast and I believe she waited for us to see her, as if she wanted to say goodbye. I hurt when my last dog died and Kizzie replaced her, but I seem to hurt 100 times more this time, even though I know I got more time than I should have with her. 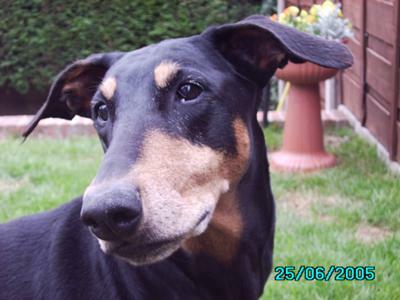 She was 13 and a half, a very good age for a dobie, but frankly I'd give everything I own just for another hour with her! And I really hope and pray that i will see her again. But for now I just have to look after her mate Levi as he is 12 and a half and needs a friend too. He is acting strangely. I'm sure he is missing her too (as he thought she was his mum)! She was always there to put him in place and to make us laugh and smile. Even now, I'm sure she is still alive, only just in me. She is one dog I'll never forget. I hope this grieving gets easier because at the moment I feel like I'm being torn apart, painfully. Although she did "go" at home, and I should be thankful for that small mercy, and the pleasure of keeping such a wonderful friend for such a long time, I've now cried more tears than I knew possible. Thank you for your kind comments. It's comforting to know there are people who either have or have not been through it and understand, and it does help to know Kizzie has been seen. I know all your pain. I went through it all november 30th 2008. Trust me, it's very hard and there is no happy pill you can take for it. Live with the memories you have of your friend. Make her proud to look down at you and see how strong you are. She will be waiting for you when it's your turn. She just had to go first to make sure everything was so perfect before you get there.